This year we did a joint party for our kiddos. Our good friends are moving to Africa and we wanted to make sure they could celebrate with the kiddos so alas the double birthday was born. 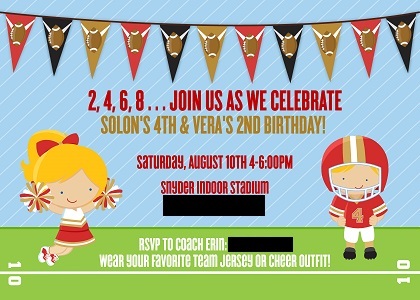 I actually was going to do a football theme for Solon and found in this birthday invite on Etsy and the theme “Football and Cheerleaders” was born. I love the way it turned out! The treat bags were a little bottle of gatorade, ref’s whistle and bouncy football…we also did tattoos when the kiddos arrived, they were a hit (sorry moms they were hard to wash off!). We did a pinata because sometimes coming up with games both big and little kids can do is a challenge and who doesn’t love candy?! I actually got the cheerleader pinata at our party store for a dollar (I know I know!) and used that to hold the balloons at the party! For the food I did cotton candy, popcorn, nachos, stadium dogs wrapped in aluminum foil and since there is nothing healthy about stadium food I threw in carrots and watermelon! I also bought little bottles of pop, water and gatorade just like they would sell at the stadium. Scott’s work has this indoor gym, perfect for the occasion. We did a “football toss” aka water balloon toss…they had a blast of course getting the dads wet! Present time…they were blessed with some nice toys!!! And here are a few more from my friends’ camera…. It was another successful party, I always enjoy planning for them. I am not sure what 5 and 3 holds, I better start pinning!